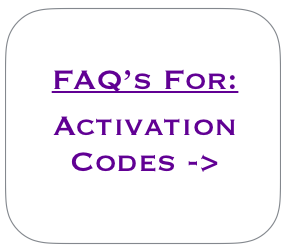 What are activation codes and how do they work? Activation Codes are simply a way for recipients to unlock or 'activate' the energies of an ebook / course prior to commencing. Once the ebook has been activated or unlocked, the energies, attunements and healing practices within the ebook now become available to the recipient. The activation of each ebook is done very simply and there is a very simple set of instructions included at the start of each ebook / course. ​activated by the recipient prior to commencing! “In order to reach the fullest potential of your Divine Destiny, we are opening the energies around you to allow a full and deep expansion to begin. With this, there will be many new changes to the way in which energies are given. Firstly, each step in the Ascension Pathways will no longer require individual activations. Instead, unique activation codes are to be presented which will unlock the energies for the recipient. These activation codes are holistic energies themselves, allowing a great force of light to behold. Within each code lies an activation sequence of many, many energies, similar to that which you may have seen in the human genetic DNA. Without fail, each code and its unique, corresponding energies unfold, step-by-step, the energies required for those particular attunement(s) and energetic frequencies. Please dear souls, please note that there is nothing on the surface ‘complex’ about the activation codes; for they are simple digits, however coupled with the intention for the intended energetic frequencies, they open and activate a great, vast, entirely complex set of energetic activations, bringing the particular energies into play.